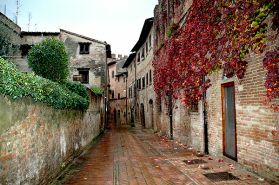 Sat, Jan 5th, 2013 It's official, you can now sign up for our October 6-19, 2013 Ceramic Workshop in Tuscany. We are teaching a 2-week throwing & saggar firing workshop at La Meridiana International School of Ceramics. All skill levels of throwers and handbuilders are welcome, including those who have always had the itch...but never scratched! Now is your opportunity. 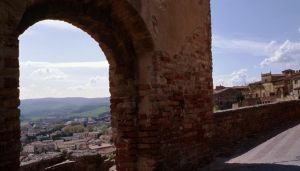 Sun, Sep 16th, 2012 Our 10-day ceramic workshop in Certaldo, Italy is just 1 year away! 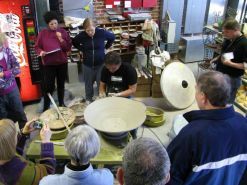 The Yin & Yang of clay, a workshop on throwing large and saggar firing at La Meridiana International School of Ceramics is 2 weeks away. 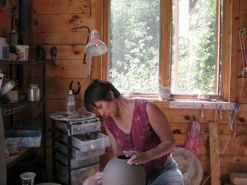 Brenda McMahon is teaching this 2-week throwing & saggar firing workshop at La Meridiana International School of Ceramics, on October 6-19, 2013. 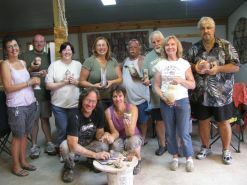 Tue, Jul 17th, 2012 Our Summer Workshop in Ohio is now over. 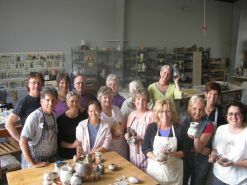 What a great group of students, beautiful pots made & fired and an altogether wonderful weekend. 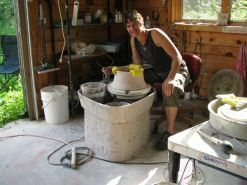 Mon, Jun 4th, 2012 Our Summer Workshop is just 4 weeks away...and I keep getting emails about burnishing. Here are a few tips. Wed, Mar 7th, 2012 What a success!!! This was a breakthrough workshop.
. It is the first time we brought a 'hands-on' component into the Large & Loose section of this dynamic duo. And the students loved it! Tue, Aug 9th, 2011 My new friend Paul Schneider - a wonderful wood sculptor - saw my work on Facebook and offered to send some bamboo and other exotic woods that he grows on his farm in Tennessee. 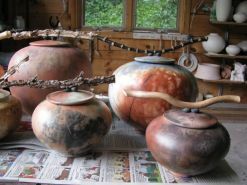 Fri, May 20th, 2011 I've been teaching saggar firing workshops since 1999. 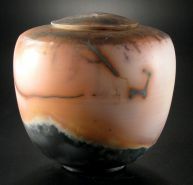 Over 12 years, I have seen tons of beautiful student results rising from the ashes of the saggar kiln. Wed, May 11th, 2011 Ok, you've been working on your saggars for the July 16 &17 workshop in Ohio. You've got it down, planning shapes, sizes and construction. 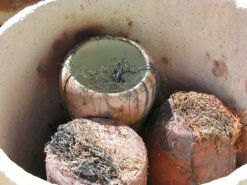 Now it's time to think about your pots. Tue, May 10th, 2011 So you've made a decision and you're signing up for the July 16 & 17 workshop - What Now? 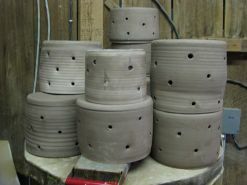 Let's say you work with 3 to 6 lbs of clay comfortably, and want to get larger - how do you double that overnight? We will show all the tricks of the trade, answers technical questions, shows nuance that will help you move in that direction. We're gearing up for our first summer workshop in a long time - and already we have a bunch of people signed up. Wed, May 5th, 2010 Our Spring Workshop is just weeks away...but you still have time to join us. So far we have a nice size group signed up with more on the way. Tue, Mar 2nd, 2010 Large & Loose, Polished & Poetic on the road...was a hit. What a group...itself large...and full of magic and poetry! We thank you so much. And from all accounts, it seems you were pleased.